There have been many varied attempts at reviving the spirit of the 1950's in the last half century. Trace them back, and you find that many of these attempts at reviving the period have their roots in the 1973 George Lucas film American Graffiti. 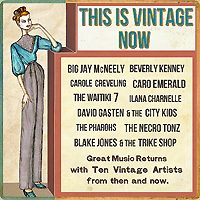 Our salute to American Graffiti comes via The Pharohs, the only rock and roll group on This is Vintage Now Vol. 1. The Pharohs wear their American Graffiti influence on their sleeve. This Denver, Colorado-based group takes their name from the leather jacketed gang in the movie, and performs songs in the general vein of the American Graffiti soundtrack. 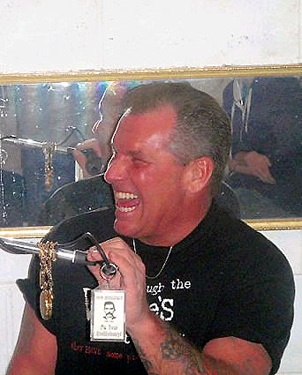 The Pharohs’ gang leader is Jerry Lee Lewis-style piano player and two-fisted bad boy Ray Evridge. Evridge is a confident and powerful frontman, and is also every bit the bad boy in real life that he plays on stage, complete with the police record. Like any gang, The Pharohs is the sum of its parts, with the equally intimidating-looking Charles Perez soaring on guitar and backing vocals, as the bedrock-like punch of metal drummer J.J. Jackson powers the music forward on their live recording of the classic Little Anthony and the Imperials song “Tears On My Pillow”. This track comes from a 2010 live show recorded in the Denver area, and is the only track of theirs that has had an official release to my knowledge. The Pharohs continue to perform locally in the Denver area.